Rep Fitness is a gym equipment company which is situated in Denver. The company is trusted for manufacturing high quality equipment, like its new barbell known as Rep Gladiator Olympic bar. After using this bar for nearly two week, I have reached to a point of giving a detailed review about this barbell. The review is broken down into some categories which will specially describe Gladiator Olympic barbell’s whip, spin, durability, grip and price. Though, I never heard of Rep Fitness barbells because in recent days, XMark, Rogue and Eleiko are boosting the barbell market by storm, so after seeing a good feedback I decided to use this barbell and give a detailed review to many fitness enthusiast out there. 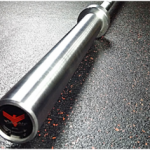 The barbell by Rep Fitness known as Rep Gladiator Olympic bar is a very standard bar which comes with 28mm diameter that fits every Olympic/bumper plate quite easily. The weight of the barbell is 20 kg and in that weight it has the capability to handle up to 1500 pounds of weight at a time. The bar comes with needle bearing which are preferred to provide a good range of spin and motion. Having a steel construction, the coating of the bar is done with chrome which prevents the rust big time. With a pretty moderate knurling the bar comes with no center knurl. The dual knurl marks helps the bar to perform powerlifting and Olympic weightlifting training. The tensile strength of the barbell is 230,000 PSI while the yield strength is 210,000 PSI. Lastly, the bar comes with a five year manufacturer warranty. 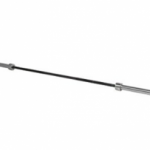 The Rep gladiator Olympic bar by rep fitness consist of a 25mm shaft diameter which is considered standard in Olympic weight lifting barbells because it supports many Olympic/bumper plates. 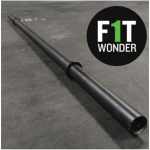 Having a 230,000 PSI tensile strength and 1500 pounds weight capacity, it is very surprising to see that a 20kg barbell can withstand that much weight without producing a bend or break in that particular range. The Rep Gladiator Olympic bar consist of good numbers of tensile and yield strength but that doesn’t make the bar best just because of withstanding higher weight capacity. With greater tensile and yield strength the bar is reported to have less whip. Whip plays a very important role on Olympic weightlifting barbells because excessive strength is required to feel the whip of the barbell. So the Rep Gladiator Olympic bar is not that much whipper as expected. 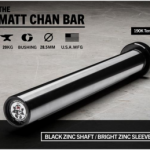 The coating on the bar is of hard chrome, which is the best choice for garage gym weight lifters, as their equipment is exposed towards different equipment more often than commercial gyms in which the barbells are well placed and rack on its specified place. The hard chrome coating prevents the bar from getting rust and corrosion in a much better way than Zinc and Black oxide coating. Hence, it is advisable for you to know thatthe hard chrome coating is pretty expensive, but offers good value of money. The spin and rotation of the barbell is very smooth and comfortable due to five needle bearings per sleeve. The needle bearings are considered best when compared with bushing bars, because in needle bearing you will be provided with a repetitive spin that is essential and vital to have if you are trying to practice Olympic weight lifting and CrossFit. Though, the needle bearings are bit of expensive than bushing bars but such type of investment is recommended to make if you want to be a professional Olympic weight lifter. The knurling on the bar is moderate which let you lift heavy weight without digging in your hands. After experiencing different type of barbells I have reached a point that the knurl of Rep Gladiator is very wide by having an excessive middle spacing. The knurl doesn’t really give that sticking on hand feellike Rogue Barbells. Hence, the knurling is still useful to perform CrossFit and higher rep workouts, which let you lift heavy without the use of gloves or powder. The dual knurl marks which are with respect to IPF and IWF standard plays a vital role on performing powerlifting and Olympic weightlifting. 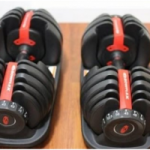 Rep Fitness had played an important role on reducing the bar’s impact sound, as dropping of the barbell in commercial or home gym is very common, which produces a very discomforting and loud impact sound. The loud impact sound is due to the high tolerance of the bar which most of the companies doesn’t really consider, while in Rep Gladiator the bar comes with low tolerance which is way better than Eleiko. Thus, producing an immensely less impact noise. Comes with a five year warranty which shows that how rep fitness is backing up their product. The warranty is against bending or breaking in which the whole component will be replaced without any additional charges. 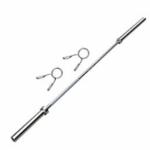 The bar comes in a diameter of 28mm while having a weight of 20 kg. Five needle bearings are constructed for smooth and reliable spin. The coating on the bar is done with hard chrome which prevents the bar from getting rust. The bar comes with dual knurl marks with no center knurl on it, making it ideal to perform clean without damaging your neck. 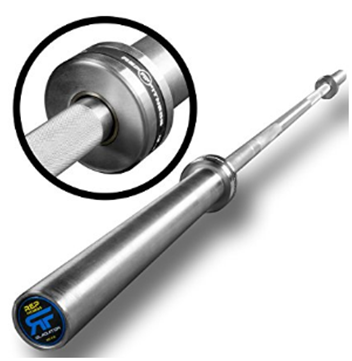 The bar consist of moderate depth knurling that doesn’t damages your hands. Collar band of blue color are constructed to identify that it’s a men’s bar. Best for powerlifting and Olympic weightlifting. Have a tensile strength of 230,000 PSI. Have a yield strength of 210,000 PSI. In my opinion, the Rep Gladiator Olympic Bar by Rep Fitness is one of the best barbell to choose if you are looking for package in which durability, affordability and quality are showed with a greater amount of prestige. I received the package within four days on my doorsteps which came in a big box which wasn’t torn apart and the component inside looked very fresh and new. The look of the barbell was really impressive and eye warming because of that shiny hard chrome coating and Blue colored collar bands. 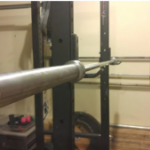 I started working out with this barbell from a certainly low weight in which the barbells whip, spin and rotation was immensely well, but soon as I incremented the weight the bar tend to became less whippy yet the spin and rotation was quite the same. Maybe because of high tensile strength this issue arrived but except of that the bar was very high quality. Overall, if you are looking for an Olympic barbell which is certainly lower priced and contains all such specifications as higher priced Rogue and Eleiko bar then it is best to consider Rep Gladiator Olympic bar for that. Coated with hard chrome which prevents the bar from getting rust and is maintenance free. The bar is essential to perform cleans because of no center knurl mark. The bar provides a smooth and reliable spin. Medium depth knurling doesn’t damages your hand, while fitting on your palm very comfortably. Easy to identify because of blue collar band. The barbell is coated with hard chrome which is really expensive. The bar doesn’t really produces a good whip because of high tensile and yield strength. Needle bearings are difficult to replace if once get damaged.